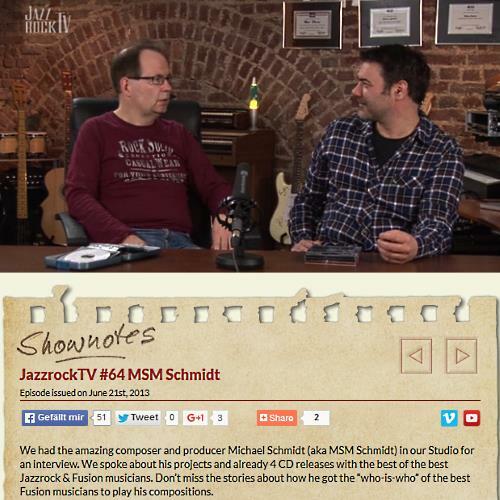 Composer and producer Michael Schmidt (aka MSM Schmidt), based in Bremen, Germany works in his day job at a large insurance firm, in his leisure time he fulfills his musical dreams in the jazz fusion and contemporary jazz genre. A long time he played in bands as drummer before he decided to concentrate on composing. Through the German drummer Wolfgang Haffner he came in contact to many supreme artists of contemporary jazz. So he finally started to record the music he loves with the who-is-who of the scene. After his debut album Arrival (2003), he released Transit (2007), Destination (2009), Evolution (2012) and this year Utopia. Mitchel Forman performs on all albums, has moreover elaborated the arran­gements and polished the pieces to perfection. 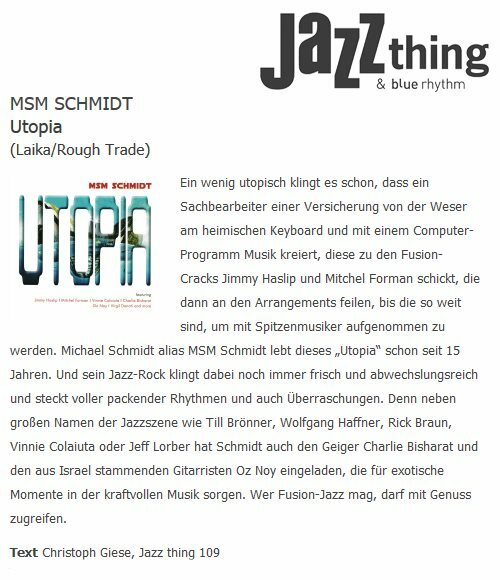 Utopia is the amazing new release by MSM Schmidt. On his 5th album he collaborated again with Jimmy Haslip and Mitch Forman as Producers. 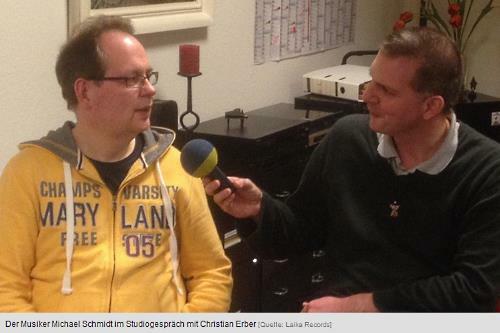 Michael Schmidt visited us in Cologne and explains about creation and recording of the album. Ein wenig utopisch klingt es schon, dass ein Sachbearbeiter einer Versicherung von der Weser am heimischen Keyboard und mit einem Computer-Programm Musik kreiert, diese zu den Fusion-Cracks Jimmy Haslip und Mitchel Forman schickt, die dann an den Arran­gements feilen, bis die so weit sind, um mit Spitzen­musiker aufgenommen zu werden. Michael Schmidt alias MSM Schmidt lebt dieses „Utopia“ schon seit 15 Jahren. Und sein Jazz-Rock klingt dabei noch immer frisch und abwechs­lungsreich und steckt voller packender Rhythmen und auch Überraschungen. 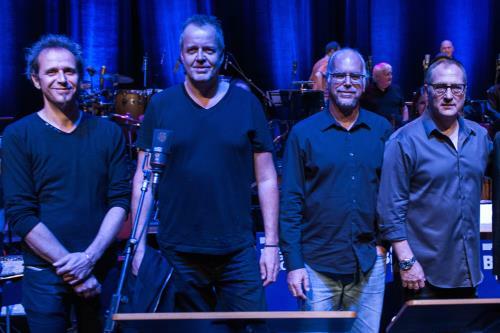 Denn neben großen Namen der Jazzszene wie Till Brönner, Wolfgang Haffner, Rick Braun, Vinnie Colaiuta oder Jeff Lorber hat Schmidt auch den Geiger Charlie Bisharat und den aus Israel stammenden Gitarristen Oz Noy eingeladen, die für exotische Momente in der kraftvollen Musik sorgen. Wer Fusion-Jazz mag, darf mit Genuss zugreifen. Der Bremer Versiche­rungs­kauf­mann Michael Schmidt leistet sich ein ungewöhnliches Hobby: die vermutlich teuerste und virtuoseste Allstar-Band des Jazzrocks. In regelmäßigen Abständen schafft es der passionierte Keyboarder, die Creme der US-ameri­kanischen Jazz­rock­szene für die Einspielung seiner Kompo­sitionen zu gewinnen. Unter seinem Künstlernamen MSM Schmidt ist gerade sein fünftes Album beim Bremer Label Laika Records erschienen. Darauf haben zahlreiche Aus­nahme­musiker zu ihren Instrumenten gegriffen - unter ihnen der Schlagzeuger Vinnie Colaiuta (der schon für Frank Zappa und Sting die Felle bearbeitet hat), der Bassist Jimmy Haslip ("Yellowjackets"), der Keyboarder Mitchel Forman ("Metro"), der Trompeter Till Brönner und der Jazz-Drummer Wolfgang Haffner. Während MSM Schmidt in seiner Heimat Bremen nur einige Insider und Eingeweihte kennen, ist er in Kalifornien – wo das Herz des Jazzrocks schlägt – alles andere als ein Unbe­kannter. Dort gehören Schmidts Kompositionen völlig selbst­verständlich zum Tages­programm zahl­reicher Radio­stationen, während sie in Deutschland geheimes Nacht­programm sind. Seine Vorliebe für Fusion und Filmmusik hört man Schmidts Kompositionen deutlich an. Die zumeist sehr energiegeladenen Stücke dauern bis zu zehn Minuten und leben von diversen Stimmungswechseln und ausgeklügelten Spannungs­bögen. Deutsches Kompositionsgut trifft US‑Amerikanisches Produzententeam mit US‑Amerikanischer Allstar-Fusionband. So könnte man grob umschreiben, wie der Bremer Versiche­rungs­ange­stellte und Fusion-Komponist Michael Schmidt seine musika­lischen Träume auslebt. 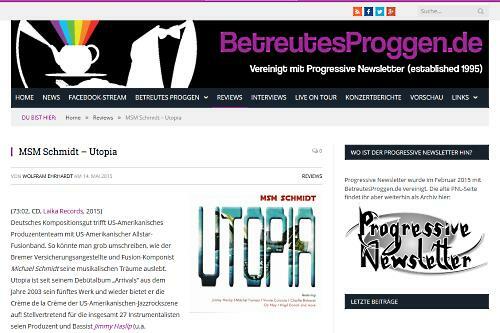 Utopia ist seit seinem Debüt­album „Arrivals“ aus dem Jahre 2003 sein fünftes Werk und wieder bietet er die Crème de la Crème der US-ameri­kanischen Jazz­rock­szene auf! Stellvertretend für die insgesamt 27 Instru­mentalisten seien Produzent und Bassist Jimmy Haslip (u.a. Yellow­jackets), Allan Holdsworth, Gino Vanelli, Michael Franks), Produzent und Keyboarder Mitchel Forman (u.a. 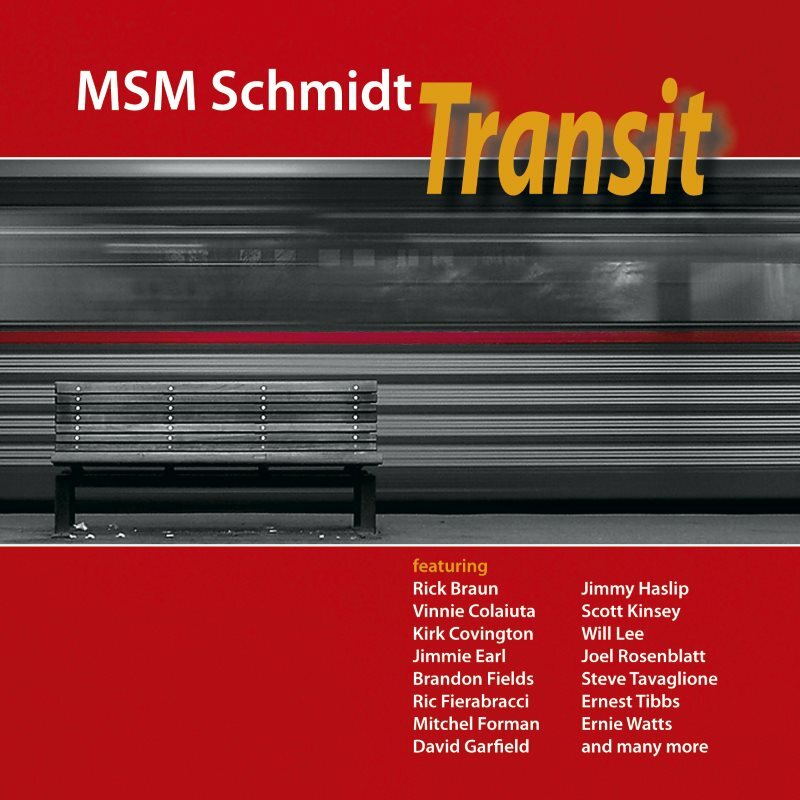 Metro, John McLaughlin), Gitarrist Chuck Loeb (u.a. 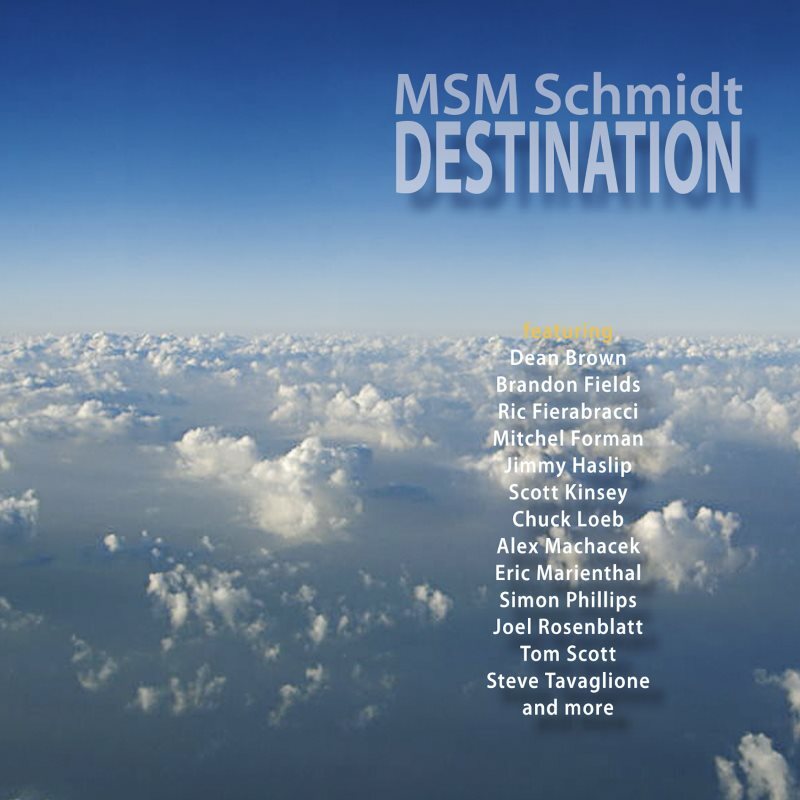 Steps Ahead, Metro, Fourplay), Schlagzeuger Vinnie Colaiuta (u.a. Frank Zappa, Herbie Hancock, Jeff Beck, John McLaughlin), Schlagzeuger Virgil Donati (u.a. Planet X, Allan Holdsworth, UK) oder Keyboarder Jeff Lorber (u.a. Jeff Lorber Fusion, John Scofield, Brecker Brothers) genannt. Außerdem sollten noch zwei deutsche Protagonisten erwähnt werden, die Michael Schmidt an der Trompete und am Schlagzeug unterstützen: Till Brönner und Wolfgang Haffner. Wolfgang war übrigens auch der freundliche Musiker, der Michael Schmidt über seine weltweiten Kontakte ermutigte, auf die einzelnen Künstler zuzugehen. While the heart of jazz fusion may live in sunny California, USA, it is strengthened by impulses from all over the world. For 15 years and counting, lots of those have been emanating from Bremen, Germany. This city, located on the river Weser, is the birthplace and home of musician/ composer Michael "MSM" Schmidt. In his day job, Schmidt works at a large insurance firm. At night, he is a passionate music composer whose works regularly make a splash in the US jazz-rock scene. His latest album - his fifth production - is entitled "Utopia". A fitting name, seeing that Schmidt is a self-confessed aficionado of science fiction. All the more so since the title summarizes his feelings towards this musical project: "Musically, I'm living in a kind of 'utopia' that has come true", he reveals, "I love and enjoy composing with specific musicians in mind, and creating music together with them." 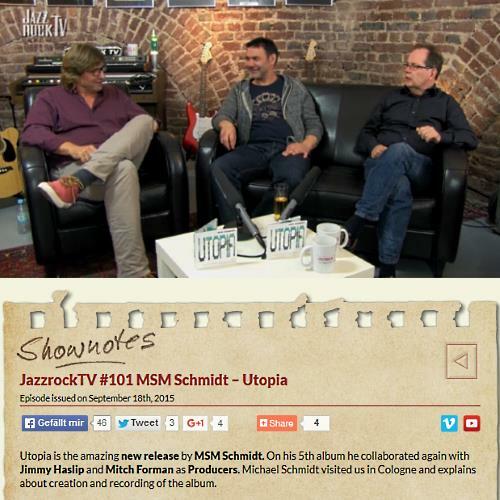 With "Utopia", MSM Schmidt and his musical dream team explore new frontiers of jazz-rock music. As for Schmidt himself, his musical dreams have by and large been fulfilled. However, he feels something is still missing: bringing the artists together so they can perform the music live in front of an audience. So far, differing schedules have been thwarting these plans. Schmidt has not abandoned hope yet and is optimistic about it: "I believe that sooner or later, this dream of mine will become reality". So in keeping with the album title, this aspect of MSM Schmidt's "Utopia" shall come true, as well. 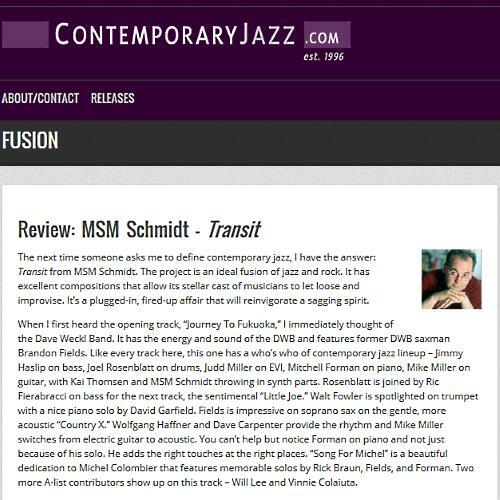 While Transit still contained some smooth songs, the new project should focus a bit more on fusion. I also wanted to bring in new musicians, with whom I had wanted to work with earlier, but it just had not happened. Mitchel Forman and Scott Kinsey on keyboards were „settled“, as was Steve Tavaglione and Brandon Fields on saxophone and Wolfgang Haffner on drums who played on all my CD´s. And with the help of Jimmy Haslip, I got Simon Phillips to play drums on six tracks. He also recorded the drums, bass and some keyboards in his studio. Mitchel Forman helped to bring in saxophone-legend Tom Scott, and I could get Mike Mainieri, the founder of Steps Ahead, to play vibraphone on two songs. Further, one of the rising stars on guitar, Alex Macharcek, also joined the project. By December 2008, all tracks were recorded, so I got in touch again with Bernd Steinwedel for mixing and mastering. All songs on „Destination“ were mixed and mastered by him, except „Hey Jimmy“, which was mixed by Jimmy Haslip and Joe Vannelli in the Blue Moon Studio, Los Angeles. I actually composed this song for Jimmy Haslip. During the time of recording, mixing and mastering, I met some of the musicians in person before or after their concerts in Germany and The Netherlands. This was an experience I don't want to miss. And only after meeting my heores, like Mike Mainieri, Jimmy Haslip, Scott Kinsey and last but not least Wolfgang Haffner, Mitchell Forman and other members of Metro and their friends, I realized that I keep composing, arranging and producing music because of all these wonderful people who bring my ideas to life by adding their touch of genius, each and every one. During the recording, Dave Carpenter, who played bass on three tracks, and whom I did not happen to meet in person, passed away. „Song for an unknown friend“ is dedicated to him. 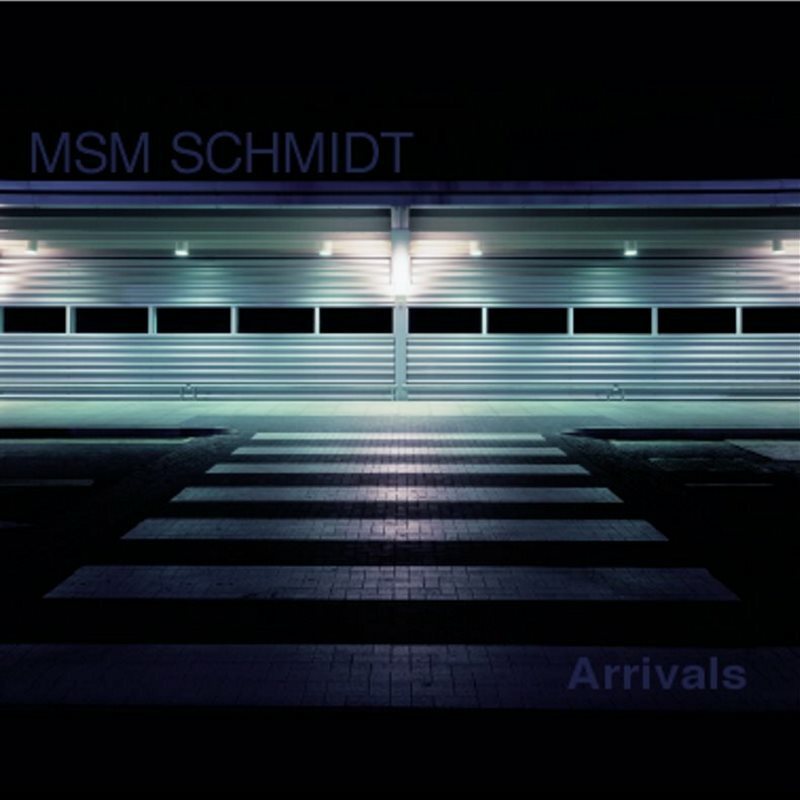 After the release of "Arrivals" in 2003 I was not sure if I should go on with a new project or finish making music. I make it dependent of new ideas and enough money to finance the whole project. My inspiration often comes from listening to great music but sometimes there are other sources, too. In this case the ideas came from new instruments and my nephew Kai Thomsen. Within one year we composed enough material for a new CD and so I was ready for the next project. After a short discussion with my partner in life, Susanne, we agreed on a budget and Susanne encouraged me to contact the musicians. Drummers Wolfgang Haffner and Joel Rosenblatt were the first to listen and play to the new songs. Wolfgang suggested to ask Mitchel Forman to coordinate the sessions and so I send Mitchel the demos with Wolfgang and Joel´s drum tracks. Mitchel liked the new songs and agreed without hesitation to oversee the project. From this moment on nothing could go wrong anymore! Besides being a great musician and a wonderful person he recorded musicians like Rick Braun, Ernie Watts, Brandon Fields, Walt Fowler, Judd Miller, Ernest Tibbs, Mike Miller and Dave Carpenter and he helped me to get in touch with Jimmy Haslip and Scott Henderson. Wow! I also like to thank David Garfield and Ric Fierabracci for their great tracks on "Little Joe" and "Rizma " which they recorded on their own studios. After all tracks had been recorded and sent to me I had the idea to give one song to Scott Kinsey who was a driving force on "Arrivals". He received a demo of Xpress which later became XPress (More than words Kin Sey). Scott got the full control over the song and arranged it like one of his own compositions. The result was something very special and after listening to the complete mixed song featuring great performances by Scott Henderson, Steve Tavaglione, Jimmy Earl, Kirk Covington and Brad Dutz the first idea that came to my mind was to safe the song for the next project. But will there be another one ? So the decision was made to put it on the new CD "Transit". Starting in 2006 the songs were mixed by the great Bernd Steinwedel in Studio-Nord-Bremen. Thank you Bernd for your expertise and your friendship. It was a wonderful experience to mix and master the songs with you! "If you don't like it, then tell us what you'd like to have changed" (an annoying remark of one of my fellow musicians sometime during the 80s). At that time, I played drums in a band and had no clue of compositions. I was a frustrated, self-taught drummer, never had any lessons, simply playing along in two bands without knowing, how to influence the music I was supposed to be playing. Helge Mruck was playing keyboards in one of these bands, and sure enough it was Helge, with whom I went about buying my first keyboard, the Roland D50 and who taught me the first steps. With his help, I started to learn an instrument that enabled me to express my musical ideas. During the long years of our friendship, we created an innumerable numbers of songs ... The numbers of keyboards grew, computers and samples were added. Together (with the help of the legendary Atari ST) we composed many songs and founded our own band: Walkin' on Ice. With this band, we also recorded a CD: "Finally". Our music at that time was already very fusion-oriented . I still played drums in our band, but slowly but surely composing became my passion. When Helge moved to England, the band fell apart. Little by little, the idea to publish my compositions on a CD came to my mind. Therefore I worked hard on those songs, that were most important to me. In order to give these songs a human touch, I hoped that some of the tracks I had created on the computer would be performed by musicans from flesh and blood and their real instruments. With friends and musicians from my hometown Bremen, topmost with Holger Larisch, we started recording a number of sessions. Some of the tracks were also recorded in the then brand new studio of Ingo Bittkau, Fährhaus Tonstudio, in the coldest winter that we can remember. Among the freezing and shivering musicians that winter were Bernd Schlott, Timm Pyttlik and Lutz Büchner. Uli Gadau recorded at a later - warmer - date. Clever! "Would you like to play to my music?" I am a fan of fusion and I love the band Metro. Their sound was and is my ideal and my inspriation, too. I wished to win one or the other musicans from Metro for my project. Therefore, I had to overcome my timidness and finally sent an email to Wolfgang Haffner asking him: "Would you listen to my music?" and Wolfgang would. Wow! 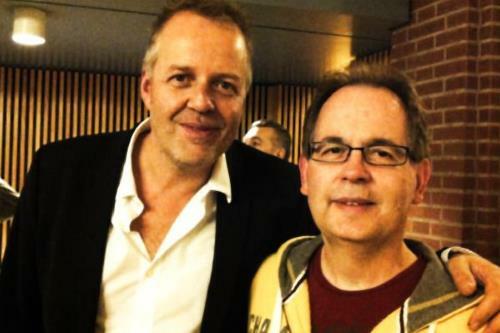 I sent him my CD immediately and Wolfgang spontaneously declared that he'd play drums on some of the tracks. Through Wolfgang I got in touch with Mitchel Forman, Will Lee and Brandon Fields, and each time I asked "Would you like to play to my music?" I got a kind and positive reply. I always sent a demo CD first and then we discussed, which other material was neccessary, the format of their recordings and of course the financials. It b went marvelously well, the musicians were in top form. Thanks to Wolfgang. At the same time, in a fit of megalomania, I contacted the brilliant saxophone player Steve Tavaglione and sent him a CD. 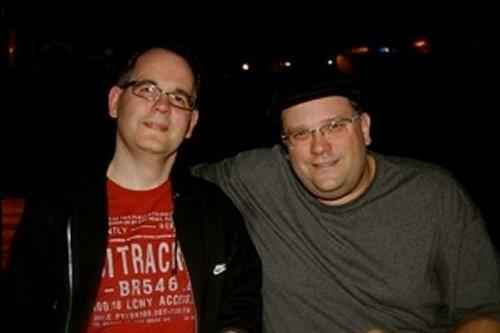 Steve spontaneously joined the project as well, and since he was going to record with Scott Kinsey, the keyboarder of Tribal Tech, and do the recordings in Scotts studio, he suggested to ask Scott to contribute a few tracks as well. This is how Scott came to join the project, and it was him, who brought in Abe Laboriel and Vinnie Colaiuta. Sheer madness! For each musician I prepared a CD . On the CD were the tracks I wanted each of them to play, once with the instrument as I had programmed it, and once without it as a kind of playback. Since I can' t read or write notes, I asked Ingo Bittkau, who helped to write the charts for each track, a hard and detailed work. Without these charts, some of the songs might have sounded differently (but not neccessarily better). Since my contacts with all the musicians were almost exclusively by email and I was not present, when they recorded, each of them had a lot of responability for their tunes. Their biggest problem however seemed to be to find time in between their studio appointments and gigs, to finally record my tracks. Waiting was the worst . But when the waiting was over and their CD with their tracks arrived, it felt like Christmas. In order to make room for each musician and his performance, I started to integrate their tracks into my songs. More and more of the tracks I had created on the computer became obsolete and consequently were deleted. Some songs really changed charakter, as may be witnessed on Before and After, a webpage which will be set up later on. 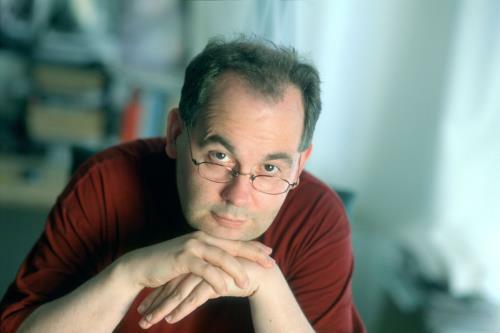 Between January and March 2002, Holger Larisch mixed most of the songs on this CD in his private studio in the quiet of the night. He would not do without recording a few extra guitar tracks. 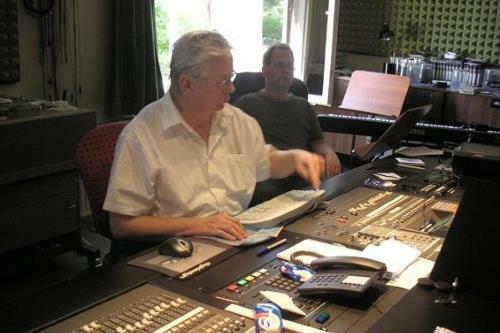 "Bouquet" and "Lullaby" were mixed at the same time in Ingo Bittkau's Fährhaus Tonstudio. In March 2002, everything could have been finished, if I had not been infected by the typical artists' disease. This infection, more commonly know as perfectionism, starts simply by making you listen to the songs over and over again, just to discover a little bit of something here and there and - finally - everywhere, leading to being dissatisfied with the production at the end (besides driving the partner crazy). Months passed simply by trying to optimize the sound. In October 2002, the songs were finally mastered in the renowned Studio-Nord-Bremen (http://www.studio-nord-bremen.de) in Bremen-Oberneuland. Besides the familiar atmosphere created by Bernd Steinwedel and Wolfgang Roloff, the studio owner (to some maybe better know as Ronnie) we shared a lot of cabbage soup, got the best coffee in Bremen and the magnificent ears of the great Bernd Steinwedel. I can only recommend any musician to have his or her CD mastered there. Before we started to master the CD I had thought about the cover design, booklet and label. I am an admirer of the arts of Jean-Michel Folon (http://www.folon-art.com) and had the opportunity to visit the Fondation Folon in Belgium in Spring 2002. I treid to get in touch with him and hoped he would join the project as well. Unfortunately, this did not happen. Therefore, I asked my longtime soulmate Helge, without whom not one sound would have happened, if he#d do the artwork for the CD. Helge had created CD artwork before, for example also for Holger Larisch' aArea 51 and for Walkin' on Ice. He was the one, who thought my CD title "Once in a lifetime" was not appropriate, because - who knows - maybe there'd be a second project following. So he suggested to call it "Arrivals" instead. I liked the idea, and Helge, who had become a professional photographer and teacher at the Glasgow School for Modern Arts started to go about looking for a motiv. Shortly after he found it, the Southampton airport, Helge became father. Ella was born and took Helge out of business for a few months. Finally, in June 2003, the draft for the artwork was finished. I had contacted various record labels, but most of them informed me, that they only take up productions of artists, who do live performances as well in order to promote the CDs. This had not been planned. Therefore I made up my mind to publish the CD myself. This wasn't too bad, since from the very beginning I had had little hope to find a record label. In the worst case, I would publish and distribute it via the internet only. I didn't have to. By accident, I got information about the local record label Starfish Music. Its owner Frank Fiedler did not hesitate to listen to the CD and to publish and distribute it. Without the brave new world of computers, from Atari ST, Mac or Windows PC, which I used over the last twenty or so years, this CD would not have happened. Keyboards and computers are my means to express and record my ideas. Internet and email enable me to get in touch with musicians at the other end of the world, whom I admire, but whose language I don't speak well enough to converse with them easily - but can take the time to write them mails, that helps sometimes. But moreover, without the support of my nephew "Dr." Kai Thomsen, talented keyboarder and gifted computer scientist, who was always there when digital trouble loomed darkest over the project and a housecall was needed, the computer chaos was solved and the project prevented from deletion. Besides all the repairs to my computer and the musical support and input, Kai and me started to create new songs, which will hopefully in a not too distant future lead to a new project. Born in 1960, I was the benjamin in the family and enjoyed a carefree and well protected childhood. I was first exposed to jazz music by my sister and brother: Since I did not have a room of my own, I bounced back and forth between theirs, listening to John Coltrane, Miles Davis and a lot of the Blue Note stuff as well as to The Rolling Stones and The Beatles. Owing to my brother, I also got to like drums. The first album I owned was "Drums Unlimited" by Max Roach. I was seven then, and also the next records I got were probably not the typical childhood taste. Don Cherry´s "Symphony for improvisers" brought my attention to Gato Barbieri, whom I admire since. In the following years, I was drawn slowly but steadily towards electronical instruments. Miles had started it, and I liked jazzrock more and more, the Mahavishnu Orchestra and all those musicians around Miles. At the same time, I also got to like the typical ECM Sound by Manfred Eicher. I loved Eberhard Weber's records. Most of my records at that time were worn out much too quickly due to the heavy rotation on the turn table. Music was the most important thing in my life. I also became a self-taught drummer and played in bands. School was a nuisance, but luckily, I managed to finish high school, and after one and a half years of alternative civil service, I started an apprenticeship at an insurance company, where I still work today. MSM by the way, is the abbreviation for my signature at work. 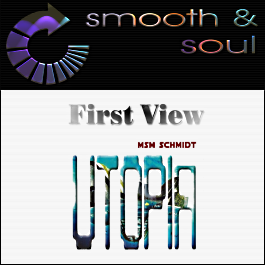 My real name - Michael Schmidt - was already occupied by another artist. (Who would like that name?!) This project mostly materialized during a part-time sabbatical, a year in which I only worked three days a week, with the support of my boss. I am an amateur musician who in a fit of megalomania scraped the money together to make it happen. Nonetheless: there may be a follow-up. Time will tell.